Following the upgrade of SACM’s website in January 2013, SACM continued to upgrade the website from time to time. In late 2015, a team was formed (the Cultural Attaché, Dr. Abdulaziz BinTaleb; IT director, Fouad Alzahrani, and website technical director,) with the task of planning and implementing a total upgrade of the website. The new version aimed at upgrading the content, improving the methods of displaying information and improving the website appearance and technicality in line with the modern trends of website functionality, including compatibility with tablets and smart phones. The current upgraded version was launched in May 2016. 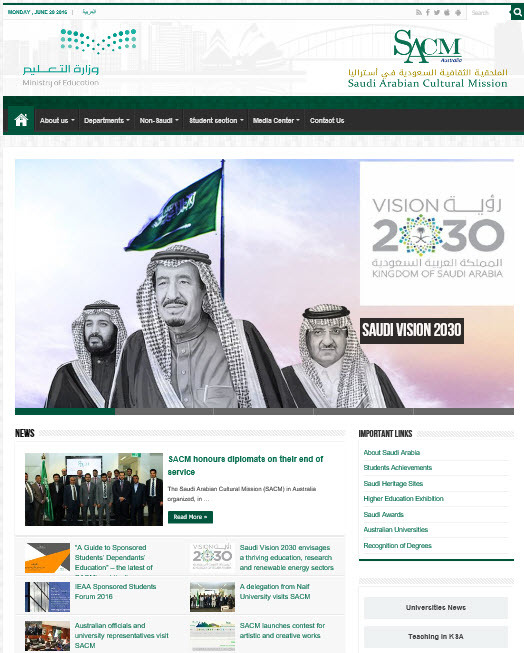 In January 2013, the Saudi Arabian Cultural Mission (SACM) launched the first upgraded version of its website. The launch came in line with SACM’s development and quality assurance programs. The version was meant to be outstanding in terms of content and easier in terms of navigation and access to information. Focus was also put on highlighting SACM’s services and providing information directly to the target groups. The website contained more than 100 pages and more than 300 active links, which were categorized according to SACM’s departments. This included overview about SACM, its history, and information about SACM’s departments and how to access their services. SACM’s staff directory was also included for ease of communication. To facilitate procedures for students, the website also contained a page for E-requests. The page provided information and guidance in regard to these requests and submission procedures. To simplify the browsing and searching, these requests were classified according to each department’s work. The website also contained a list of educational institutions recognized in Australia, starting from language courses up to PhD degrees. Note: Some links on this page may redirect the reader to Arabic pages for student use. Titles of these links are translated into English to indicate SACM’s scope of services. Early 2013, as part of SACM’s quality assurance & development programs, SACM launched a new version of its current website. The new version is designed to be distinguished in contents, easily browsed and to provide easy access to information. The website focuses on services offered by SACM, and provides clear information directly to target visitors. It contains more than 100 pages and more than 300 active links categorized according to departments’ scope of work. They cover information about SACM’s history; departments and organization structure; staff directory; publications and development programs. A page of e-Requests was also created with information and advice on those requests, in order to explain and facilitate the submission procedures for students. To make browsing easier, the e-Requests have been categorized according to departments’ scope of work. A list of Australian recognized higher education institutions is also included, from the language level to PhD. SACM Australia has pioneered honoring of distinct students. In this connection, SACM’s website contained a “List of Honor” publishing names and achievements of distinct Saudi students in Australia in various fields. The aim of the list is to encourage students toward success and distinction. The website also contains a FAQs page which provides answers to common questions asked by sponsored students. The page contains more than 200 Frequently Asked Questions (FAQ) and their answers about SACM’s role and services, thus saving time and effort for student to find answers for their queries. The page of Saudi Student Clubs in Australia on SACM’s website contains names, photos and contact details of presidents and vice presidents of the clubs and their websites. In line with its efforts to link King Abdullah Scholarship Program (KASP) graduates with Saudi employers, SACM has created on its website a page containing advertisements of job opportunities announced by Saudi private and public corporations, with explanations of requirements and application procedures. The new version of the website also provides helpful links pertaining to life and study of sponsored students in Australia, such as links to the Royal Embassy of Saudi Arabia in Australia; Saudi Ministry of Education; SAFEER (students’ e-services portal); SACM on YouTube; Twitter; Facebook; Saudi press and iEN educational TV channel. The Cultural Attaché supervises and monitors the website upgrade process, while deputy Attachés are responsible for contents of pages relating to their departments. The Cultural and Social Affairs Department is responsible for the technical operation of the website, editing the Arabic and English news covering SACM’s events and producing SACM’s publications. Easy to browse – usability tested. Focus on information and interface design. Procedural and guiding pages, which provide useful information for sponsored students during their scholarship terms. Pages order and sequence set according to major needs of sponsored students or candidates. Guiding lists in the bottom of the Home Page (Before Coming to Australia; Beginning of the Journey; During your Journey; In the end). Screenshot of guiding lists in the bottom of Home Page. Main lists cover SACM’s scope of work and contain sub-lists. 7 more sub-lists for easy access to some important pages. These lists are updated continually. Screenshot of sub-lists in the right of Home Page. Important news about SACM’s events and activates of Saudi student clubs in Australia. A “List of Honor” publishing names and achievements of distinct Saudi students in Australia in various fields, updated every month. Links to social media channels. 12 communication channels, with information about each of them. FAQs and answers, categorized according to SACM’s scope of work (academic affairs, finance, joining scholarship and electronic support). Guiding videos to show students how to prepare and submit applications and requests. New icons on the home page for easy access to other websites useful for students.